Just 14 years ago it would have been easy to dismiss Luyuan as a nothing more than a small out-of-the way, rundown district, never likely to provide much of a future for its 435,000 residents. It's not a mistake you would make today. This unremarkable suburb of Changchun, the regional capital of the northeasterly Jilin province, is now the scene of a minor economic miracle - one that has bucked the global slide into financial misfortune and one that should give hope to the residents and local governments of towns throughout China. "While the financial turmoil has taken a heavy toll on the global economy, Luyuan maintained remarkable economic growth in 2008. "The district's gross domestic product (GDP) rose to over 9 billion yuan last year, a 25.5 percent increase on 2007. Significantly, it was also 9 percent higher than the average for Changchun. Overall, Luyuan's fiscal income amounted to 1.3 billion yuan - up some 28.6 percent." According to Chen, figures for fixed-assets investment in the district were even more impressive. These showed a 10.9 billion yuan total for 2008 - a whopping 45.3 percent year-on-year increase. The huge turnaround in the district's economy is, in part, down to the some 170 new and expanded projects that have been registered with the district authorities. These include key projects, such as construction work that has already begun on a rail transportation equipment park and a trade logistic park. The French supermarket chain, Carrefour, and the Huatian Hotel had also both opened for business by the end of 2008. The district has also seen itself rapidly emerge as one of China's most important automotive spare parts manufacturing areas. This explosive growth has been fostered by Luyan's proximity to two of the country's leading carmakers - First Automobile Works (FAW), and the Changchun Automotive Industrial Development Zone. The district is hoping to reap similar benefits from the establishment of a rail transportation equipment park. Currently under construction by Changchun Railway Vehicles Co Ltd, the park will cover an area of 5 sq km and is expected to begin operations later this year. The new facility has already committed to a three-year contract said to be worth more than 120 billion yuan. It is expected to achieve an output value of between 30 and 50 billion yuan within five years. It's anticipated that the district will quickly become a focus for ancillary industrial enterprises and a base for rail transportation equipment research and development (R&D). It is expected to become home to a number of production, testing, exporting and international logistics enterprises. Situated in west Changchun, the district is expected to form a vibrant commercial hub, with auto spare parts and rail manufacturing as its core industries. Improvements to the infrastructure serving this increasingly busy district have seen construction work begun on the development of Changchun West Railway Station. The work is scheduled to be completed by 2011 and the local government envisages the new rail facility as the nucleus of a surrounding commercial zone. More than 10 billion yuan has been earmarked for developing the site and its immediate environs. With industrial development well underway, Chen says the city government's next priority is to develop both commercial and residential spaces. Chen said: "We plan to develop Luyuan in line with the successful growth of its automotive and railway manufacturing facilities, and the establishment of its new railway station. Our blueprint for the area sees us nurturing the growth of the surrounding six towns and areas." These growth plans include the extension of the industrial area through the combination of a development zone with an ancillary industrial cluster. Additional plans include the re-development of the district's existing low-quality housing zone, the provision of a new 12 sq km urban area; the creation of an 18 sq km commercial and residential area, and the establishment of a 25 sq km trade logistical park. 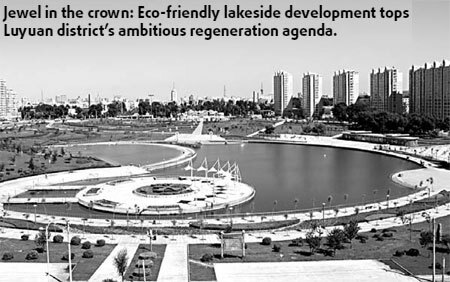 The jewel in the crown of the rejuvenation package will be the construction of an eco-friendly townscape on the banks of a nearby 100-hectare lake. 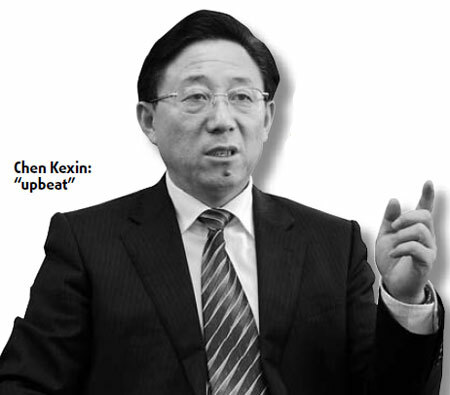 Chen believes that, as Luyuan's economic rebirth has emerged under the shadow of the global financial crises, it is ideally suited to weathering the downturn and continuing to grow its local industries. He also believes that it will benefit further from the country's massive stimulus package. China rolled out a 4-trillion yuan stimulus package last November to cushion the growing impact of the global financial crisis on the country's economy. Policymakers also reduced borrowing costs for local enterprises and relaxed credit restrictions to help prop up domestic investment. Viewing the financial crisis more as an opportunity than a serious challenge, the district believes its development projects will attract further investment and new projects. Chen said: "We expect fixed-asset investment to grow 40 percent year-on-year in 2009 to 15.3 billion yuan, following a rise of 45.3 percent in 2008. "We also expect to secure 4.5 billion yuan in domestic investment and $40 million in foreign actual investment this year, compared to 4 billion yuan and $35 million in 2008." The district government has set a 20 percent GDP growth target for the whole of 2009, pushing it towards the 11 billion yuan mark. Total fiscal income is expected to rise to 1.6 billion yuan, up 26 percent, whilst industrial output is projected to rise 37.4 percent to 12.5 billion yuan.